EDMONTON, Oct. 17, 2018 /CNW/ – On this historic day, Aurora Cannabis Inc. (“Aurora” or the “Company”) (TSX: ACB) (OTCQB: ACBFF) (Frankfurt: 21P; WKN: A1C4WM), is proud to celebrate consumer legalization by commending governments of all levels for their commitment to bringing an end to the prohibition of cannabis for adult consumer use, and acknowledging the decades of activism and effort that have led to this moment. With retail sales beginning in provinces across the country today, Canada is the first G20 country to take this historic, transformative step. The country now stands as the world leader in cannabis public policy, innovation and acceptance. “It’s a proud day to be Canadian,” said Aurora CEO Terry Booth. “For the last three years, the world has watched as we prepared for legalization as an industry and a country. The end of prohibition is a victory for advocates, for activists, for science, for personal freedom and for common sense. The Canadian Cannabis Community is strong, smart and resilient. Aurora respect and honor the will of advocates and activists who fought and continue to fight unjust laws that limited the righteous adult access to cannabis. Aurora is one of Canada’s leading licensed producers and a developer of high-quality cannabis products to markets across the country and around the world. This thriving new Canadian industry has created jobs and prosperity across Canada and Canada is setting the global standard in crop production, product quality, cannabis science, and patient care. 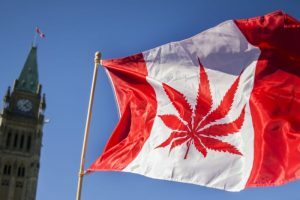 Canada has now become the second country in the world following Uruguay to fully legalize adult consumer cannabis. On the medical side at least 31 countries around the world have federally regulated medical cannabis. While legalization of cannabis for adult consumer use is an exciting milestone, as Canada’s leading licensed producer of medicinal cannabis, together with wholly-owned subsidiaries CanniMed and MedReleaf, Aurora reconfirms its commitment to its medical patients, including the Canadian veteran community. Aurora is proud to work with government and private retailers across Canada to supply a broad range of dried flower and higher margin products such as pre-rolls, oils, and capsules. Aurora’s integrated teams and its strategic partners, have entered into supply arrangements with provinces and territories accounting for more than 98 per cent of the Canadian population. The Aurora and MedReleaf brands, including San Rafael ’71 and AltaVie, are expected to have a strong presence across the country, positioning the Company well for rapid growth.